It seems that material design will never go out of fashion. From year to year, this Google-inspired web design trend evolves and penetrates hundreds to thousands of new websites. It’s impressive how different websites built in material style may look like. While some of them are incredibly bold, others are minimalist and flat. 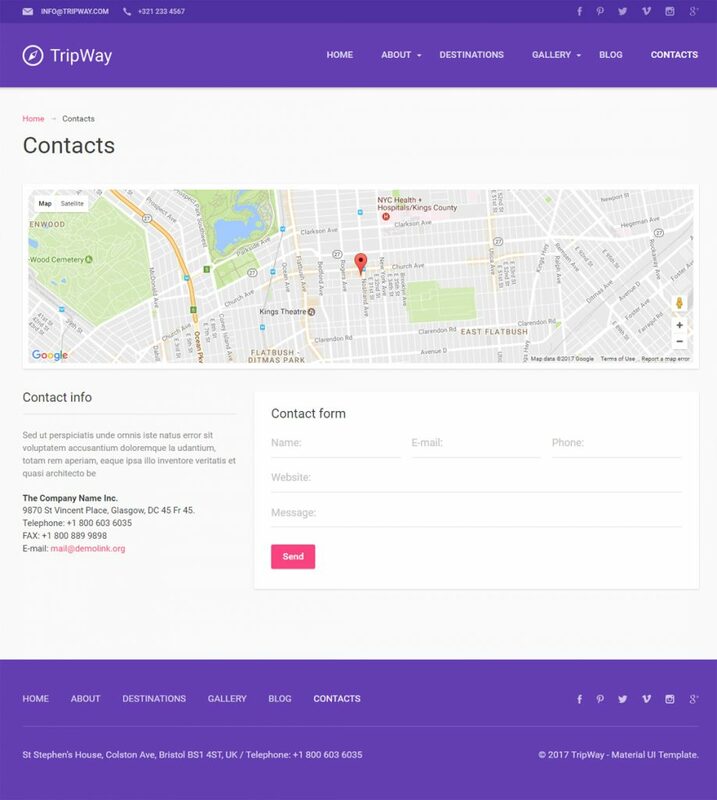 For this review, we have hand-picked a material design inspired WordPress Theme for travel agencies and tour operators. This is a fully responsive ready-made design that was developed by TemplateMonster. Although it may look somewhat simple at the first glance, the functionality that it stores under the hood is truly impressive. The template is intended to draw attention of the web community to the content shared on the pages of a travel agency it represents. Owing to whitespace, texts and visuals are brought to the foreground. Readable fonts, well-defined sub-headings, and clear content hierarchy provide for its better readability. The theme is designed in a way that can captivate attention of first-time visitors, introduce them to your offerings in a user-friendly manner, and encourage for a deeper investigation. As you can see, the theme is built with elements of material style. Bold, eye-catching design elements perfectly harmonize with a well-balanced layout structure. Negative space makes CTA buttons look more outstanding. A grid-based content structure allows you to kill two birds with one stone. On one hand, you can share different pieces of data without cluttering the pages. On the other hand, you can make it easier for visitors to scan through your content in search of the data that is of interest to them. 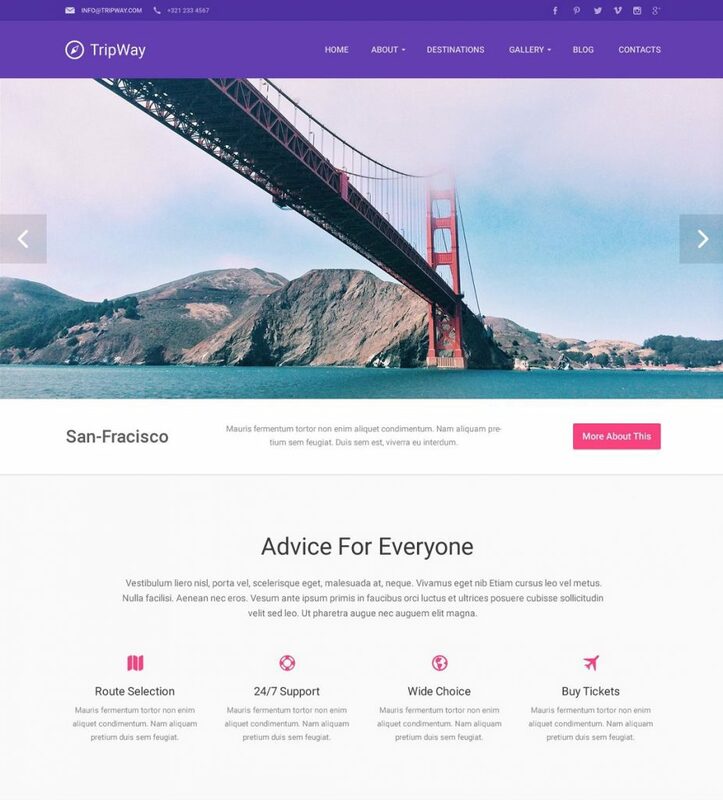 Clear layout of this travel agency WordPress template is enhanced with smooth animation effects, providing for a more interactive browsing. Thus, the header features a page-width carousel slider. The parallax scrolling effect is intended to get every visitor immersed in a captivating storytelling as they reach a site. Created using HTML plus JS animation, the theme is also enhanced with Lazy Load effect, which makes the design applicable to content-rich online projects. Making the site data appear on the page as a person scrolls down to the bottom enhances the overall usability of this pre-designed template. Taking into account that more than a half of web searches happen from the screens of smart devices, the template runs on the fully responsive Bootstrap framework. This releases webmasters from the necessity to create a separate mobile version of their web projects, which saves loads of time, money and energy. All elements of the theme’s designs, as well as all types of content provided on its pages, are intended to look smart of the screens of a variety of smartphones and tablets. Cherry Framework 3.1.5 is at the core of this responsive WordPress template. Due to its integration, the theme is easy to handle even by those webmasters who are making their first steps in web development. A handful of pro customization options, multiple post layout variations, a rich collection of shortcodes, various widgets, modules, and other options are included for a better performance of the given design. 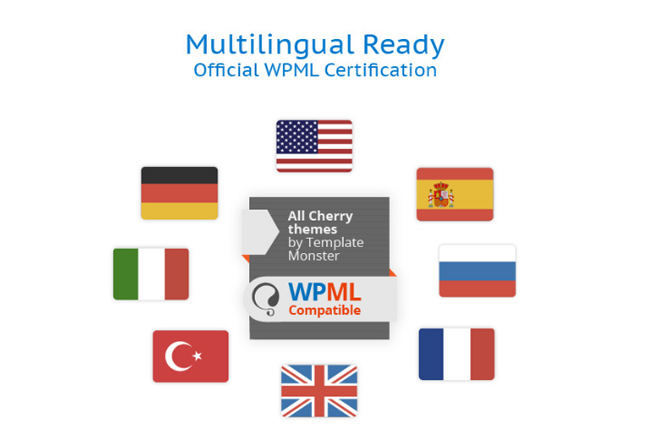 One of the most useful characteristics of the template is the support of WPML plugin. Due to this, one can create a multilingual site accessible to international audiences. Due to this functionality, webmasters can feel the ease of translating any piece of content into a variety of foreign languages with ease. We guess that any business that launches its own web presence follows the primary goal of building a trustworthy and reliable look. When building a site on the basis of this template, you can achieve the desired results by means of user reviews displayed on the site’s homepage. Easy-to-reach and organized in a user-friendly manner, customer reviews are intended to reveal the opinion of real clients to prospective customers, thus making a company look more trustworthy. Every user who wants to leave a feedback about the services that he tested is also welcome to leave an honest review on the page. Such functionality is supported. The WordPress theme is loaded with a set of working forms, which are also intended to establish a better contact with the audience. A simple contact form can be placed on the homepage, on a contacts page or in any different place of your site. By means of a newsletter subscription form, a user and subscribe to your updates with a single click, and remain always informed about your news and special deals via email. Social media integration allows you to boost online follower base manifolds. Every element of the theme’s design targets to make it quick and easy to launch your own web project. Thus, the download package includes a selection of custom page templates to get started with gallery, blog, destinations, and contacts pages hassle-free. The availability of layered PSD files lets you apply all necessary changes to the ready-made design, without the necessity to create it from scratch. Cross-browser compatibility and SEO-friendliness of all of the theme’s components have become indispensable parts of all TemplateMonster products. Well-documented and featuring free 24/7 support, the theme is fully editable. It can be adjusted to match a variety of tourism-related businesses, as well as hotel sites, voyage booking, etc. 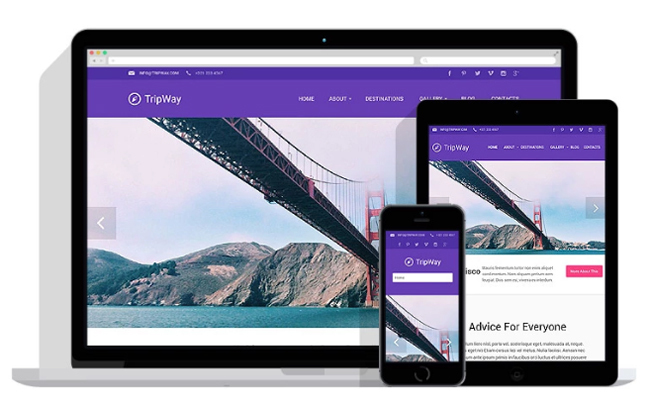 In the end, we’d like to conclude that this responsive Travel Agency WordPress themes features every single piece of functionality needed to kick start a powerful yet user-friendly online project. The availability of a handful of smart modification options, Cherry Framework and Bootstrap, working forms, support of all content types, custom page templates availability, and an eye-pleasing layout enhanced with impressive animation options make this theme worth a try. Go ahead and visit TripWay for more details. Live demo version will showcase its full potential in real-time. Check out the way the theme performs on all screen sizes and in different web browsers. Isn’t it a perfect match to launch a reputable travel website?